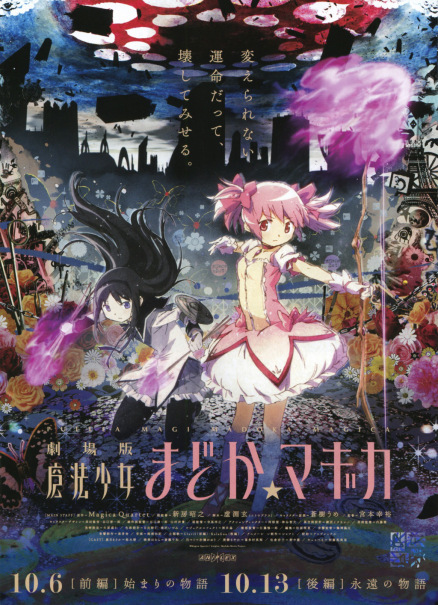 So, late last week I reviewed the first Puella Magi Madoka Magica movie, Beginnings, and if you haven’t already read that review then I suggest you go do so before jumping into this one. 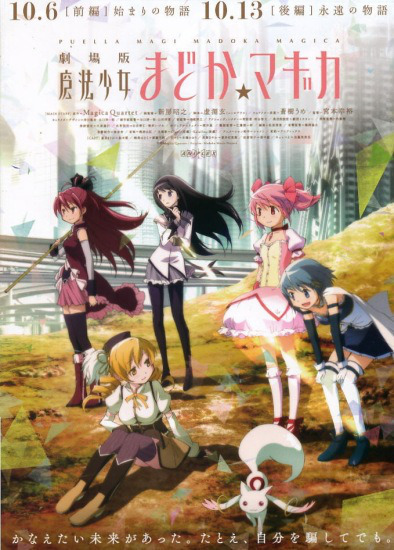 Now, Eternal covers the final four episodes of the original TV series, which are the most memorable of the Madoka Magica episodes. Has this movie done the story and series justice? This entry was posted in Anime, Anime Reviews, Reviews and tagged Anime, Homura, Madoka, Madoka Magica, Magical girl, Mami, Puella Magi Madoka Magica, Review, Sayaka on 26th August 2013 by Demelza Ward. Madoka Magica. 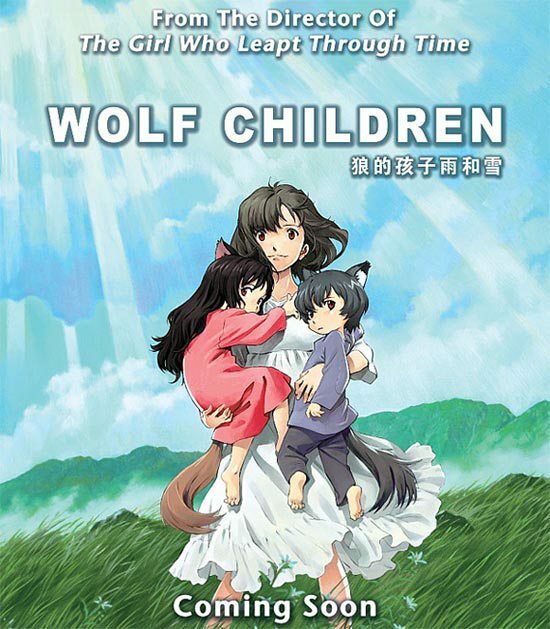 It’s the title of an anime that you can’t really have gone the past two years without hearing about at least once. It’s the one show that has become quite famous to say the least and it’s the one show that every anime fan knows about one way or the other. The first two Madoka Magica movies were released on Blu-ray at the end of July, and so I’ve thrown together a review of the first movie with the second to follow sometime soon. Can the first movie live up to the Madoka Magica hype? One of the important things to note about the first two Madoka Magica movies is that, the two are retelling’s of the TV series. The first movie, Beginnings, covers the first eight episodes of the TV series while the second movie, Eternal, covers the final four episodes. Sounds like the first movie has its work cut out for it, doesn’t it? Well, it does and it doesn’t. Beginnings manages to cut down the first eight episodes to fit into just over two hours of runtime. Mostly this doesn’t affect the story as much as you might suspect, but (as with trying to cut down any series as strong as Madoka Magica), it does come at a cost. A lot of the earlier episodes of Madoka Magica are spent with Madoka and Sayaka getting to meet and bond with Mami. Sadly, because Beginnings is pushed for time it feels like a lot of the time spent with Mami is lost and/or rushed and Mami loses a lot of value because of it. We don’t really have time to get attached to her, nor do Madoka and Sayaka, and while it’s easy to understand in the TV series why her death has a lasting effect on Madoka and Sayaka, it’s much harder to understand it in Beginnings. Early on in the story the death of Mami is one of the most important factors in the choices Madoka and Sayaka make, and this holds true for the movie of course, but having not spent as much time with Mami it becomes very hard to relate to and actually feel for Madoka and Sayaka. That said, Mami aside, the rest of the story has been handled with very well and it doesn’t feel like we’ve lost anything else of value from cutting the episodes down. Sayaka is the focus of the story near the end of the Beginnings, as the movie finishes with the scenes of Sayaka turning into a witch after falling into despair. Beginnings does well not to cut anything of value regarding Sayaka and thus we feel as much for her as we did watching the TV series. Beginnings is of course treated to some very pretty animation in certain places and looks very nice for it. If you thought Madoka Magica looked brilliant to begin with, then you’ll find a lot of joy watching the movie because it’s simply stunning in places.Beginnings also features a very subtle but impressive soundtrack. Nothing is bold and stands out, but everything fits perfectly and it’s a very nice listen on its own away from the movie. Aniplex have kindly bundled the soundtrack CD with the collectors edition of the movies release leaving you with little excuse not to give it a listen. In closing: Madoka Magic: Beginnings kicks off the retelling with a bang, but the loss of time spent with Mami does mean I wouldn’t recommend the movie to people who haven’t watched the series before. It just isn’t quite as powerful as the TV series is, but it’s still brilliant in its own way. This entry was posted in Anime, Anime Reviews, Reviews and tagged Anime, Film, Madoka, Madoka Magica, Mami, Puella Magi Madoka Magica, Review, Sayaka on 22nd August 2013 by Demelza Ward.